Chinese New Year is a hectic time of the year for expats. Travel becomes difficult, many establishments and facilities close and cities, such as Guangzhou, empty out as locals head to the countryside to spend time with family and friends. As a foreigner living in the city, it's a great time to take a vacation. Lucky for us, the PRD is a quick flight from numerous tropical locations. So, for this week's 5 Things we spoke to Elena Robertson, an American expat living in Cambodia. While ex-pats living in Cambodia may be griping about the ‘cold,’ we secretly love it. Coming from a country with actual winter weather, our freezing temperatures of 18 Celsius will be a welcome change. Siem Reap has seen endless sunny days for the past month, with nighttime temperatures of 17-20 Celsius and daytime temps of 23-33 Celsius. Down by the coast, the sea brings a welcome breeze so tanning isn’t too strenuous. The winter months offer the best weather of the year. With relatively low humidity and sunny skies Cambodia’s beauty is more obvious than ever. Siem Reap is known for its nightlife. Whether your budget is USD0.50 Anchor draught beers or USD6 lemongrass Tom Collins, there’s a bar for you. Pub Street isn’t the only place to get wild, although it does host institutions such as Angkor What? and the Temple Bar. The alleyways around Pub Street offer some of the best bars and restaurants in town. Budget favorites include the Triangle Bar, which has USD0.35 beers from open until 4pm everyday and Charlie’s, which has daily specials and great food. If you’re less concerned about penny pinching, check out Picasso’s, Miss Wong’s, Soria Moria Hotel or the Siem Reap Foreign Correspondents’ Club (FCC). Sihanoukville is Cambodia’s answer to Koh Phangnan, with beach bars providing plenty of space for hedonistic debauchery. JJ’s Playground is always a wild time while Led Zephyr hostel offers great food, live music and decently priced drinks. Phnom Penh is more refined than Siem Reap and Sihanoukville, and the PP Foreign Correspondents’ Club offers history, fabulous views, delicious food and creative drinks. Cambodia has an incredible variety of terrain, from beachside cities to sleepy river towns, mountainous regions to meandering rivers, tiny villages to the pulsing capitol of Phnom Penh. Highlights include: the Cardamom Mountains, Mondulkiri and Ratankiri, Kep/Kampot, Islands (Koh Rong, Koh Tansay, Rabbit Island etc). It may be a cliché for every Southeast Asian country, but Cambodian people are some of the friendliest on earth. Always willing to lend a hand, Khmer people are generous and eager to join in conversation. While this is not an across the board truth (would you enjoy driving drunk tourists around town every night? ), Cambodian culture is incredibly inclusive. Just remember, you’re a guest in this amazing country and should be as kind and respectful as possible. Perhaps the most obvious draw, Cambodia is home to the incredible Angkor Temple complex. The temples in the immediate vicinity of Angkor Wat, the largest religious complex on earth, are not to be missed. Keep in mind Angkor Wat is only the surface of the remains of the Angkor Empire. About an hour from Siem Reap lies the Great Preah Khan of Kompong Svay, an un-excavated and un-restored temple larger than Ta Prohm (the famous Tomb Raider Temple). Preah Khan Temple offers an incredible look into the ability of nature to engulf human creation. It is a truly humbling experience. Because these un-restored temples are quite a drive from Siem Reap and the Angkor Complex, crowds are virtually non-existent. Consider hiring a mini-bus for the day and enjoy a drive through Cambodian countryside en route to awe-inspiring adventure. While the temples serve as a reminder of Cambodia’s ancient history, they are also fraught with the more recent history of the Khmer Rouge. Mercifully left unmolested, the temples are some of the only pre-khmer rouge history left fully intact. When in Phnom Penh, a visit to the Killing Fields and S-21 cannot be missed. Reading one of the many books about the Cambodian Genocide, such as First They Killed My Father, is a good way to contextualize the emotionally chaotic experience of the Killing Fields and S-21. // To see more from our 5 Thing series, click here. 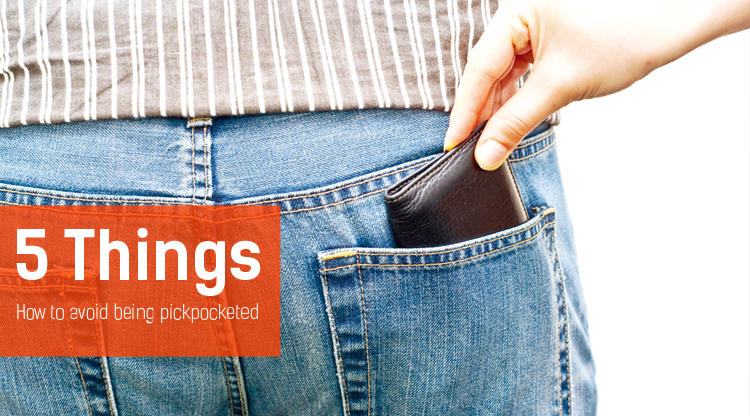 Pickpockets are a common problem in many of the world’s cities. Here in China this is indisputably the case.